is limited, we go with what’s easiest. what to me was a big secret. to various right wing agendas. information which they assert to me true. in an ethical, above board way. their system and making it a less useful tool. will get this economy back on the right track and really shore up the strategies that we need over in Iraq and Iran to win these wars? Two Can Play The ‘Guilt by Association’ Game…. Mini-Docu – “Gook, John McCain’s Racism”…. 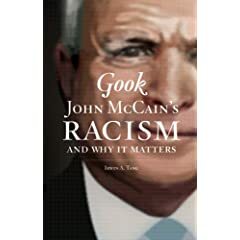 The author of Gook: John McCain’s Racism has offered a super-mini-documentary regarding his new book. If You believe in censorship then, STFU !!!! Why listen to music or watch movies by Corporations and artists who want to put you in prison if you copy, share and/or distribute their copyright work. Creative Commons allows you for the most part to freely own, copy, share and distribute media. Check it out !!!!! Stop supporting assholes who want to imprison you for what comes naturally to all of us !!!!! Great Deals on really good books. Presenting titles hand-picked by Powell Bookstore Staff at 70% savings. Be sure to check out the newest great deals at Powells often.